ore security integrators are looking for ways to create brand-new high-tech systems designed around IP-technology using the existing analog coaxial infrastructure or newer transmission networks. The number of IP-technology benefits far exceeds what traditional coaxial CCTV systems can offer. IP surveillance provides not only superior image quality and remote accessibility but also the latest video analytic capabilities and more. 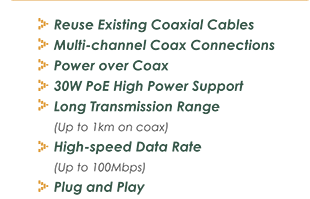 OT systems developed a full-line of Ethernet-over-Coax products to support the existing analog systems upgrading to IP networks in an easy and affordable way. By installing this EoC series, customers can retrofit the existing coaxial cabling installed. 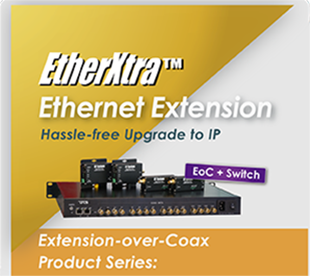 Ethernet-over-coax product line consists of a single-channel EoC extender per IP camera to multiple-channel receivers (from 4 to 16 inputs) either in stand-alone or rack-mount installation, offering space saving benefits. Installers can choose AC/DC inputs for either a centralized- or distributed-power-system design. Moreover, some receivers have switching capabilities to save Ethernet ports on core switches. 's maximum coaxial cable distance is up to 1Km (on RG-59/U) which well exceeds the 300m limit found with older analog CCTV systems. In addition, series supports Power-over-Coax (PoC), allowing the IP camera to receive Power-over-Ethernet (PoE) from the products. No additional power point is required on the camera side, resulting in a simpler system installation. With all these unique features, meets a variety of customers' IP requirements by utilizing the current coaxial infrastructure. It is the perfect solution for IP surveillance system upgrades.